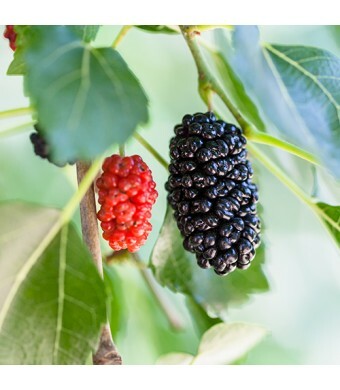 Our Dwarf Mulberry can produce fruit year round and is also a beautiful ornamental tree. Our Mulberry Tree (Morus nigra) is native to southwestern Asia. 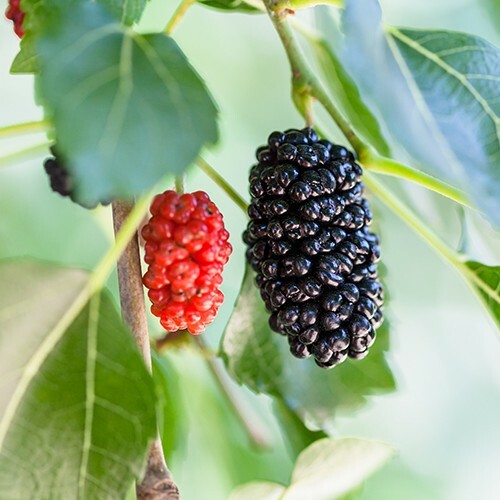 The Dwarf Everbearing Mulberry Tree is a fast growing tree that produces fruit in the spring (if planted outside in the ground) and are heavy bearers of fruit. If kept in a container and protected from the cold, our Mulberry Tree will not go dormant and will produce fruit year round. A fruiting Mulberry can offer buckets of berries each year. Mulberries are a super-food that make delicious jams, jellies, wine, cobblers, muffins, sorbets, pancakes. pies and smiling, happy children with purple lips and fingers.